Benign cystic ovarian tumors are frequent in teenagers and young adults due to hormonal imbalance and thanks to the existence of advanced imaging and early diagnosis methods, these tumors are promptly treated (conservative treatment – hormonal treatment). Occasionally, these tumors reach vast dimensions due to some patient’s negligence and only go to the doctor’s office when the tumor becomes visible to the naked eye. Surgical treatment for benign cystic ovarian tumors is laparoscopic because of the short recovery period and also because of a lower risk of developing postoperative eventration. 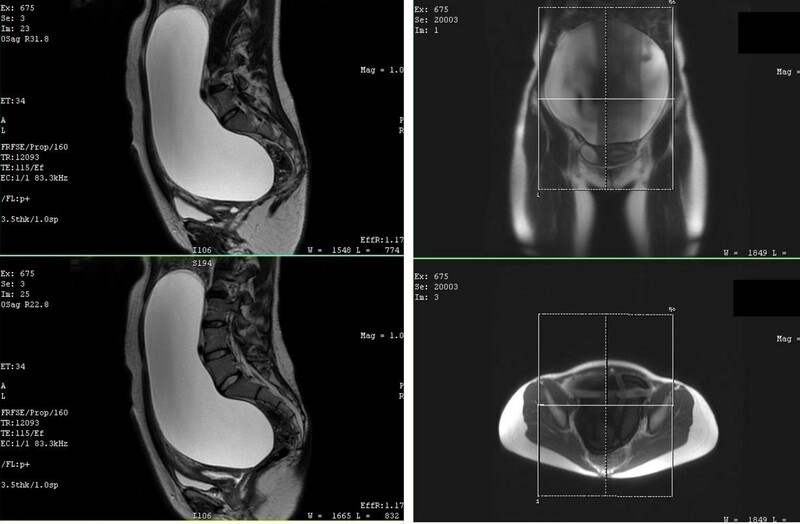 We present the case of a 20-years-old patient, with history of right gigantic ovarian cystic tumor (~22 cm cranio-caudal diameter) diagnosed in another medical department (with the use of ultrasound, CT, MRI), presented for admission accusing pollakiuria and abdominal distension. Biohumoral testing had no significant alterations, tumor markers (CA 125 and HE4) and ROMA score within the normal range, suggesting the benign character of the tumor, alongside the CT and MRI results. We operated laparoscopic, using Hasson technique to puncture the cyst. The excision of the tumor was difficult (it was adherent to the uterus, the large ligament, parietal pelvic peritoneum and uterine wall). Postoperative evolution was favorable, histopathological examination showed the tumor was an ovarian serous cystadenoma. Conclusion is that periodic ob-gyn consultation and quick medical care in case of genital or abdominal symptoms occurrence could improve the chances of partial or total preservation of the said ovary and better chances of using laparoscopic approach in young patients.